"A Guide to Colorado's Best Photography Locations"
Some places are particularly photogenic, they produce quintessential Colorado images. 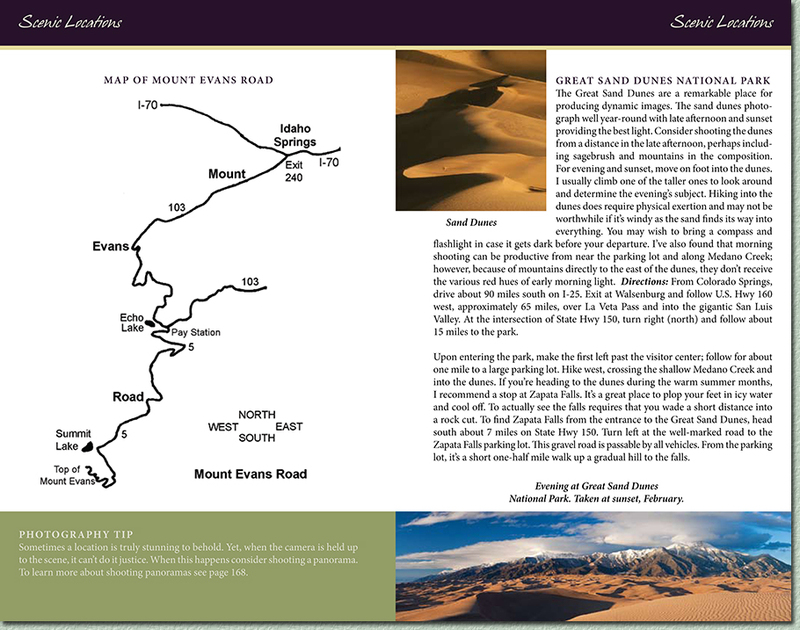 Below is pages 110 & 111 from the scenic locations section of the book. The following is a sample paragraph from one of the scenic hot spots discussed. Maroon Bells & Maroon Lake define Colorado. They must surely be the most published, rugged mountains and mountain lake scene of Colorado. Most photographs taken here place Maroon Lake in the foreground and the dramatic Maroon Bells in the background. This location photographs extremely well anytime of the year, however, the best lighting is found during sunrise and early morning while the sun is behind you. Maroon Lake is just a few miles from Aspen and very easy to find. Directions: Drive north out of Aspen on State Hwy 82. As you leave town, but before you reach the airport, you will enter a traffic circle (roundabout). Take the Maroon Creek Road exit and follow about 10 miles to its end. Park in the large, paved parking lot. From the parking lot, walk west on the trail about 100 yards to the lake. Note: There is a $10.00 per vehicle entrance fee. In order to control the number of visitors June through September, Maroon Creek Road may close during the day from 8:30 a.m. to 5:00 p.m. During these times, a shuttle bus from Aspen transports visitors to the lake at a cost of $6.00 per adult.